Published: July 19, 2012 at 03:05 p.m.
And now the dominoes will fall. Indianapolis Colts owner Jim Irsay tweeted this photo of No. 1 overall draft pick Andrew Luck signing his four-year, $22.1 million contract Thursday. The Indianapolis Colts signed No. 1 overall draft pick Andrew Luck, NFL.com and NFL Network's Albert Breer reported Thursday, citing sources with knowledge of the situation. According to Breer, the fully guaranteed deal is worth $22.1 million over four years with a fifth-year team option, includes a $14.5 million signing bonus and doesn't have offset language. In comparison, Cam Newton, last year's No. 1 overall draft pick, received a four-year, $22.025 million contract with a $14.5 million signing bonus from the Carolina Panthers. 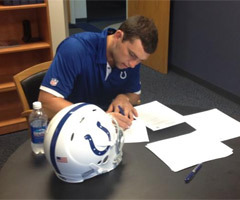 Colts owner Jim Irsay later announced Luck's signing on Twitter, complete with a picture of him putting pen to paper. The former Stanford quarterback is under lock and key one day after the Washington Redskins signed Robert Griffin III, the second overall pick in April's draft. Many speculated that Luck's people were waiting for RG3 to strike a deal before the Colts rookie made it official with Indianapolis. In another year, this would represent high drama. But Luck wasn't expected to miss training camp, which doesn't start until July 25 for the Colts. The NFL rookie slotting system has turned this process into a systematic, almost predictable, chain of events. Now that Luck and RG3 are sealed up, we expect the other unsigned first-round draft picks to fall in rapid succession.